why i love inter-faith conversations. * This month’s Synchroblog is centered on what we appreciate about other religions. You can see the link list of other bloggers writing on this topic at the bottom of this post. I am grateful that almost 2 years ago a friend of mine from Denver invited me to the interfaith group she had been attending. I have been part of holding space for intra-faith dialogue (i love this little post that not that many people read) in different ways for a while (so hard!) but had longed to meet leaders of completely other faiths to learn, to listen, to grow, to consider, to engage, to discover-what-we-have-in-common, and to uncover-our-unique-differences. I admit, I was nervous at first. Meeting new people who share a common language, traditions, and core beliefs is awkward enough. Engaging across multiple world religions and different strains within those religions felt even more awkward because I wasn’t sure what I was supposed to know. But I noticed something right away, from the minute I walked into the room filled with leaders representing Islam, Judaism, Christianity, Hinduism, Buddhism, Unitarian Universalism, Baha’i, Mormonism–a spirit of openness and humility. A willingness to listen. A desire to take time out of busy days to be together. A passion for justice. A heart for people. Ears for deep listening. I am only on the very fringes of what I hope to learn. Time prohibits some of what I wish I could do with some of these relationships but it’s opened up my heart and mind and soul and expanded my own Christian faith in so many ways. I have loved inter-faith conversations. 1. There’s so much to learn. Oh, there’s so much I don’t know. Holidays I have never heard of, spiritual practices I wasn’t aware of, organizations doing great work on behalf of people that I had no idea existed. Almost every time my eyes are opened to how much I don’t know and I am reminded how much I have to learn! 2. People in the conversation sure know how to listen well. Following the 5 Habits of the Heart by Parker Palmer (1. an understanding that we are all in this together 2. an appreciation for the value of “otherness” 3. an ability to hold tension in life-giving ways 4. a sense of personal voice and agency 5. a capacity to create community), there’s a sense of truly honoring each other and holding a space for our differences in grace instead of so much polarizing that I’ve experienced in some intra-Christian-faith conversations. 3. It humbles me in a way I need to be humbled. I am consistently reminded that there are so many people in this world deeply guided by their faith to serve and love others, and that Christians do not have the market cornered on this. It also reminds me that faith is not something to be taken lightly. Despite all my own faith shifts and the reality of so many others deconstructing once-deeply-held beliefs, faith is a guiding force in the world and worth deep respect. Being part has increased my reverence for God in a way I needed in this season of my spiritual journey. 4. It has brought peace, not fear. In many of the old circles I used to be part of, there is a deep mistrust of people of other faiths. We see this strongly in the horrible bent against Muslims right now and the fear-mongering going on. We hear it in the people who proclaim we must hold on to “the truth” and not be deceived by the world or others who lead us away from Christ. This spirit of fear is so sad to me because it means we are coming from a place of insecurity. When we come into these conversations with a rooted sense of security and agency, it’s easy to participate. Often people think that inter-faith means watering down our faith but it’s been just the opposite. It’s helped me strengthen my own Christian faith in such a sweet way. 5. All roads lead to friendship. I say it over and over again because it’s so true. When we learn how to be friends, everything changes. And we learn how to be friends when we sit at equal tables, side by side, eye to eye, heart to heart–listening, learning, eating, laughing, wondering. When people talk bad about our friends, not some abstract-thing-we-hear-on-TV, the game changes. 5. It’s our best hope for real change in the world. We have so much more in common than it often seems. We are care about so many of the same things when it comes to social justice. So many systemic problems are just too big for any one of us to tackle. We need each other. There are so many opportunities for collaboration. There are so many ways we can represent together a different kind of power than the world’s power. There are so many ways we can advocate for each other so that hate loses its hold. There are so many ways we can participate in shifting things that need shifting. There are so many ways we can band together on behalf of justice and love and peace that people couldn’t ignore or dismiss or ruin or divide. I’m just a baby in all of this, less than 2 years in with so much to learn, but I know this for sure–inter-faith conversations have expanded my own faith, stirred my heart, and inspired a dream for what justice might really look like in our cities if we all worked together. The verse that came to mind as I was writing this was Micah 6:8. When it comes to inter-faith conversations, I hope to keep learning how to act justly, love mercy, and to walk humbly. Justine Steckbauer – Christianity and Other Religions: Many roads or exclusive path? Bram Bonius – What can Christians learn from neo-pagans and ‘magickal’ traditions? Thank you Kathy your post is lovely and it has blessed me to read it today. What comes to my mind is some lovely conversations I have had with a Buddhist who is on of my dance partners. What I am about to do is risking going against your recommendations about not suggesting reading a book with friends and family going through a faith shift but can’ I do so on this case without it being deemed to be hurtful? Can I suggest the book “Radical Acceptance” by the Buddhist Tara Brach as being helpful? 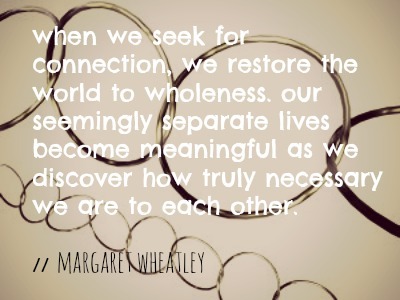 Much of what she talks about there is consistent with what you talk of with connection, wholeness and our interdependence with each other. I would again share that if I practice forgiveness and compassion I find that is conducive to peace and connection and belonging with others which is what I desire. I’ll keep on saying it in spite of the wrong and painful responses I get sometimes, of accusations of either enabling abuse or heaping on abuse to victims of abuse on doing so. For me experiencing peace and connection that comes from compassion and forgiveness outweighs facing the fear of disapproval and the pain of undeserved suffering from false accusations. For me, facing fear and facing pain in this way is the pathway to relief and freedom from pain and fear. I’ll leave anyone to choose whether to honour my being and open and vulnerable in sharing about this (or as has happened on previous occasions) to attack with the fiery darts of words that hurt and do not help. I hear what you say Kathy about the spirit of fear and insecurity. Yes, there is this. I face fear in what may happen as a result of me posting as i have now. The way I see it is that facing fear in such a way that you have shared by bringing your fear out into the open and being vulnerable is an act of courage. I honour you for that. Many people do not take such risk and evidence of faith but in their own insecurity and fear hide from true connection and play it safe, coping with insecurities with unhealthy distancing, controlling, addictions, etc. and ending up lonely and missing out on their deep desire for connection. It’s sad, calling the ones who do what they are afraid to do misfits rule breakers and trouble makers. Systems are threatened at such times and people that find comfort in systems feel threatened and respond accordingly. They will say your courage in facing fear is your weakness when what you have to offer is to be a change agent and a cure for societies ills. I agree with you about connection being a real hope for change in the world. Ultimately connection with perfect love and real power and security that is in the universe. Some call it love some call it having the heart of Buddha, some the Holy Spirit, divine order, life force, the will of God. What you say about being a baby Kathy reminds me of what in Buddhism is spoken of as being a beginner. The way i see it the more I learn and the greater wisdom I have, then more I realise how little I know and how littel wisdom I have in comparison to what can be known and what wisdom is available in the universe. AMEN … THANK YOU … JESUS WOULD SIT DOWN WITH FOLKS AND LISTEN, UNDERSTAND, LAUGH, LOVE AND ACCEPT US JUST AS WE ARE……. Thank you Jane. There’s much good to be had from sharing, love.a right good laugh a decent night’s sleep. I had a laugh with someone and said I would pray for her recently when she shared of some of her struggles. I talked about what in my reality I have known to be the power of prayer pointing to scripture when Jesus spoke in the synagogue about bringing release for the oppressed. She sent my a text a day or two later saying that she slept right through the night for the first time this year, attributing it to me praying for her. Of course that what just part of it, she had to be vulnerable and open herself up to receiving from God. Thanks for this great article, Kathy. I’ve only been a part of a few formal “sessions” of interfaith dialog. They have been meaningful, though. When I attended Centers for Spiritual Living in one period, I appreciated how they would feature core teachings and helpful perspectives from numerous religions although Jesus’ teachings seemed to be the most referenced and influential on the movement. One might say it is “interfaith” itself. And this is refreshing and healthy. Though I came back to my Christian roots, in a much more progressive way, I can seen myself having remaining there, growing and being able to help others. Between input from there and my own reading, etc., I came to make an informed, deliberate choice to plug back in among Christians; and I enjoy it greatly, but without the need to declare Christianity “best” among religious or “spiritual but not religious” options. I love continuing to learn from the others. i love your last line! Good post, Kathy. I think interfaith conversations help us to understand that people of other faiths are usually nothing like the worst examples of members of those faiths who we often see portrayed in the news. They’re not all terrorists, and they need to see Christians who are not homophobic, violent, anti-female, of a certain political persuasion and unloving. it is so true, all of the stereotypes, of every faith from christian to muslim to everything in between. breaking down these generalizations is so important!